Roboadvice is close to our hearts as one of the first themes, but for digital lenders, to erode the walls around the most expensive parts of financial services. Between Mint.com in 2007 and our world in 2019 is an ocean of difference. We highlight three symptoms that show just how far we have come. First, Schwab announced a new pricing model for its digital wealth and financial planning offering. Core robo portfolios will remain free by earning interest on the cash allocation (listen up stablecoins! ), while the human-augmented service will cost $30 per month with a $300 onboarding fee. While prior attempts at paying directly for planning services were attempted unsuccessfully by Learnvest, and Robinhood has a freemium model where a subscription fees earn you a margin account, Schwab is a way-bigger fish. We've pointed recently to the importance of understanding subscription as a shift from selling a manufactured product for a price (even if it is financed over time) to filling a consumer demand holistically. Subscriptions don't have lockups, can't take excess economic rents if your account grows from $100,000 to $500,000, and shift the business risk back to the business. They also squarely place Schwab among the likes of Apple, Google, Netflix, Microsoft, Salesforce and other *modern* consumer companies. Goodbye 1.5% on a minimum $1 million in assets for overpriced private equity and IPO access. For now, $30 will only get you traditional money management. But if Bitwise and Abra get their way -- among dozens of other high quality companies -- investment infrastructure and associated choices will be changing entirely. Bitwise, a crypto-index fund with a passive approach, had authored a stellar document linked below describing the state of digital asset markets. In it, they show how to separate the 95% of noise in fake, manufactured crypto exchange volume created by bots to game rankings from the 10 real exchanges on which demonstrable human activity is taking place. We are building in the age of the Internet, and with that comes fake traffic, fake news, fake Twitter followers, and fake financial products. This document, and efforts by folks like Messari and DASA, is clearing the way for digital-native assets to actually work. None of this ecosystem, from investors to products to allocations to exchanges to crypto regulation, even existed in 2007. So where is it going? One example is Abra, which has grown from a pure Bitcoin wallet to a provider of a synthetic asset allocation built using contracts-for-difference. While CFDs may not be accepted in all jurisdictions, don't look at manufacturing but at the customer. 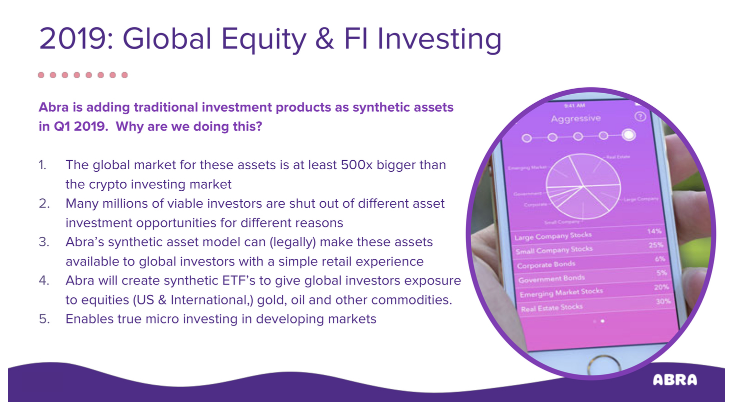 If a user can access stocks, bonds, real estate, private equity, gold, commodities, Bitcoin, tokens, banking accounts, loans and payments all from an app, that is the Holy Grail. And that is what the next 10 years is all about. The custodians and broker/dealers that have traditionally supported investment businesses, from Fidelity to Schwab, will move to integrate, own and support digital assets as well. And in that environment, solutions will not need derivatives to offer what is the most sensible package for the consumer. It will just be on your phone.